A view of Wasilla, Alaska that ran in today’s Wall Street Journal (MCT/Landov). Thursday night I watched Obama’s speech with a bunch of boisterous Dems in an Irish bar in midtown. Friday I woke up happy, happy, happy. The sunlight over Brooklyn was a cheery Crayola yellow. The phrase “It’s morning in America” actually ran through my head (I know. I know.) And then I went online, mostly to read the reviews of the speech. Instead, I began to pick up on the rumors about McCain’s choice of running mate. As he planned, McCain kidnapped the news cycle, corrupted the meaning of “change,” and sucked all the joy right out of me. Since then, I’ve done nothing but read political blogs and news websites. Now it’s clear that this Sarah Palin thing isn’t working out as McCain intended. I’m not exactly a political blogger, so I’ll spare you the details of troopergate, bridgetonowheregate, secessiongate, earmarksgate, babygate, etc. etc. etc. I just want to share a couple of observations. First, the person who came immediately to mind as I watched the pep rally in which Sarah Palin was introduced was Michael “Heckuvajob Brownie” Brown. Maybe I thought of Brownie because the other major news was that Hurricane Gustav was heading toward New Orleans and was due to arrive on the first day of the Republican National Convention. I tried to imagine how a McCain/Palin White House would tackle the problems I care about. I tried to envision them radically updating our nation’s transportation infrastructure or creating a grid that helps increase the efficiency and practicality of alternative energy sources or making our cities and towns more energy efficient, healthy and sustainable. My imagination failed me. WASILLA, Alaska — The town Gov. Sarah Palin comes from has long sold itself as the “Home of the Iditarod,” the dog-sled race across the Alaskan wilderness. But the Iditarod mushers no longer mush in Wasilla, where Gov. Palin, Republican presidential candidate John McCain’s running mate, used to be mayor. In 2003, race organizers moved the start 30 miles to Willow, in large part because real-estate developers in Wasilla have cut too many new driveways through the old sled trail, making it hazardous for the dogs to maneuver. But Wasilla’s population has jumped 80% since 2000, to 9,780, according to the U.S. Census Bureau. With the new residents have come more stoplights, along with acres of fast food restaurants, big-box stores and subdivisions in the valley between the Chugach and Talkeetna mountain ranges, 45 miles north of Anchorage. Gov. Palin didn’t start the suburbanization of Wasilla, but she urged it along during her two-term mayoral administration, from 1996 to 2002. Later, I read the comments of Anne Kilkenny, who lives in Wasilla, posted beneath a Washington Independent article. On top of everything else, Kilkenny says, Palin “turned Wasilla into a wasteland of big box stores.” So along with all the other retrograde things she represents, Palin is a proponent of the dumbest form of growth. If elected, she’ll be the vice-president of exurbia. In additon to all the scandals that have, in five short days on the national scene, attached themselves to Palin’s skinny resume, I add the one that I can really sink my teeth into: sprawlgate. Her career began in Wasilla, Alaska , population about 7,000, where she was the mayor in the late 1990s. The town was booming. 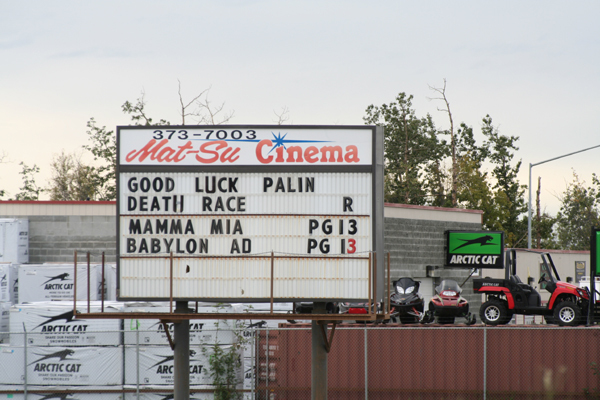 Sales tax revenues poured in from big box stores, allowing Palin to gain a reputation as a fiscal conservative by cutting property taxes even as the town budget grew to include projects such as an ice rink complex. P.P.S Check out this guided tour of Wasilla that I found at Streetsblog. 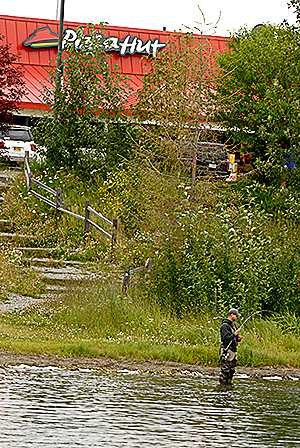 From a photo tour of Wasilla by Mudflats, the best blog in Alaska.